Homepage. This page: Mr H. Burrows, a radio engineer working in and around Bideford, is invoiced for petrol. Warmington's Garage in the late 1940s. At the time of Google's Streetview camera car driving up Bridgeland Street in Bideford, number 7 was looking eerily empty, yet several decades ago it was home to Warmington's Garage. 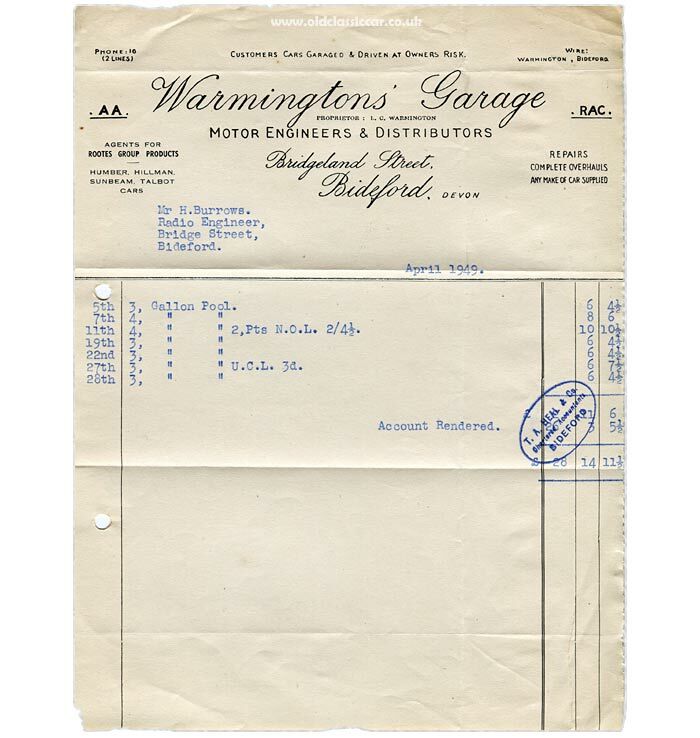 The business, established in 1927, exists to this day albeit at a different address, but in 1949 - the date of this invoice - it was a thriving garage and Rootes Group (Humber, Hillman, Sunbeam-Talbot) dealership in Bridgeland Street. Despite Sunbeam and Talbot merging in 1938, the header on this invoice still lists the two manufacturers as separate entities. Fuel restrictions were still in operation in 1949, evidently Mr Burrows' occupation as a radio engineer enabled him to continue fuelling his car or van with Pool petrol, plus a shot of upper cylinder lubricant and a couple of pints of Duckham's NOL engine oil. Contemporary cans of NOL tell that this particular lubricant was officially approved by the Austin, Ford, Jowett, MG, Morris, Riley, Rover, Standard, Triumph and Wolseley car companies, but no mention of Rootes Group cars. Warmington's Garage was established in the late 1920s as already mentioned, and by 1935 it was RAC approved and listed in their handbook, albeit under the name "Seward and Warmington", at both Bridgeland Street and also Clovelly Road in the town. The latter address doesn't appear in the 1953 handbook, but the proprietor's name is now given - L.C. Warmington, which is repeated in the heading of the above invoice. There are no clues that at one time 7 Bridgeland Street was a garage, with, presumably, one or more petrol pumps, either on the pavement outside or else tucked under the archway visible on the right. Do any photos survive of these premises when used as a garage? With this invoice came another, dating to 1964, when Mr Burrows bought a new Thames 307E van from a different garage in the town. That can be found on this page.